The Check-4-It™ app will run on all major smart devices: iPhones, iPads, Android Smart Devices and Amazon Fire Tablets. These are easily downloaded using the various App providers. It is not required to be continually connected to the internet to use the Touch Screen Application. Similar to the touch screen, the Administrative PC programs run under Windows Version 7 and higher. If the PC has the ability to run Microsoft Windows, then it will easily run Check-4-It™. The Check-4-It™ programs are written using the Microsoft Office development platform. All code is digitally signed with secure certificates. All signing certificates are registered under ‘Corporate Data Design Inc.’ thru the Go Daddy Secure Certificate Authority - G2. Data is stored on both a secure cloud server and on the Administrator Pc’s in an encrypted database file. Backups are performed nightly on our server and periodically on the Administrative PCs. Our cloud server is housed with Amazon Web Services (EC2) in a MySQL database. 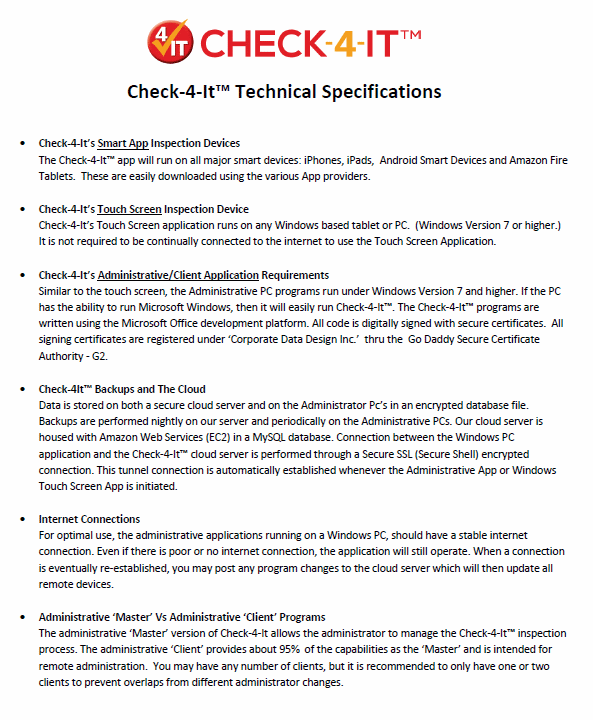 Connection between the Windows PC application and the Check-4-It™ cloud server is performed through a Secure SSL (Secure Shell) encrypted connection. This tunnel connection is automatically established whenever the Administrative App or Windows Touch Screen App is initiated. For optimal use, the administrative applications running on a Windows PC, should have a stable internet connection. Even if there is poor or no internet connection, the application will still operate. When a connection is eventually re-established, you may post any program changes to the cloud server which will then update all remote devices. The administrative ‘Master’ version of Check-4-It allows the administrator to manage the Check-4-It™ inspection process. The administrative ‘Client’ provides about 95% of the capabilities as the ‘Master’ and is intended for remote administration. You may have any number of clients, but it is recommended to only have one or two clients to prevent overlaps from different administrator changes.